John and Shari Elliot are the new owners of Newberg's Grocery Outlet store. The couple took over operations June 29. John Elliot has ample experience in the grocery business, having worked for Safeway for more than 34 years. 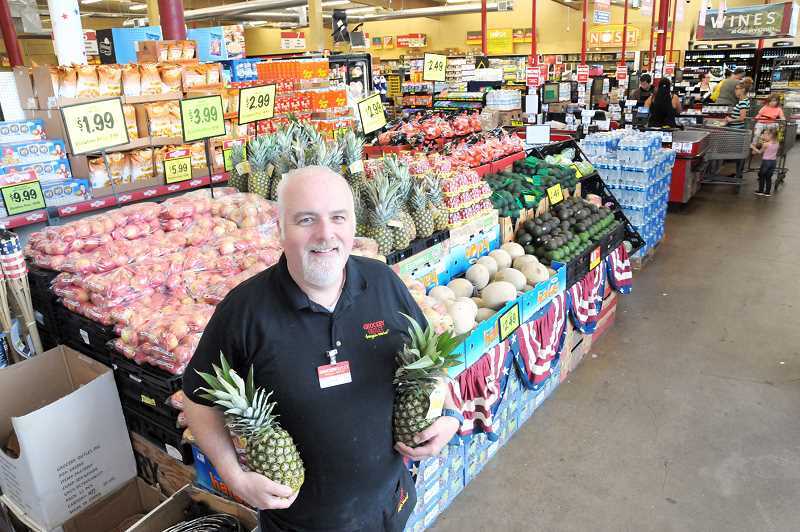 "I started (at Safeway) as a high school job and I kept the job as a college job to put me through school and by the time that I was graduating for a different career, I was already somewhat in management and I ended up staying in that track," he said. "I ended up managing Safeway stores for 19 years." After more than three decades at Safeway, John Elliott sensed it was time to move on. "Through a culmination of things, there were signs that it was a time for a change," he said. "I had friends that had done Grocery Outlets and I said, 'I'll take the chance and go for it.' I was in training for two years before this store came open." While similar to a franchise, Grocery Outlets are technically a partnership between the owner-operators and the corporation. Grocery Outlet Inc. supplies the groceries to the owner-operators, who are responsible for day-to-day operations, management, inventory and personnel. "We were thrilled when this store came open because we wanted to stay in the area," John Elliot said. "We advertise that our prices are 40 to 60 percent less," he said. "Grocery Outlet Inc. are opportunistic buyers … A lot of our items in hard lines, health and beauty items and some of our groceries are opportunistic. So, they get these great deals -- it could be a label change, a size change or a test product. "We try to supply the basic products, eggs, milk and sugar and would like to get to the point where the customers can do all their grocery shopping in our store." As a result of opportunistic buying, Grocery Outlets are well known for having good deals on inventory that customers may not see every week. In fact, oftentimes items will appear in the store, then disappear for a weeks or months only to re-appear later. Taking over ownership of the store will also allow the couple a kind of ministry. "One of our passions for my wife and I is that no matter the socio-economic background, we think it is important that everybody that wants to eat healthy can eat healthy," John Elliot said. "The natural, the organic, the healthy and the special items are out of reach for many price-wise. We are passionate about that; we are trying to build that part of the business and Grocery Outlet Inc. is trying to do the same thing." He added that his motto is to build and be part of the community. The store is working with George Fox University on a food bank the school is initiating and is partnering with Newberg FISH on its Feed the Need program. "A customer can donate $5 with all the proceeds going to FISH and we're giving back a coupon that they can come back and use on the next purchase," John Elliot said. "In fact, I just added it up and already by last Friday, we have donated almost $850 in just six days."